Washington quarters were originally designed by John Flanagan in 1932 and have become one of the longest-running United States coin series. Washington quarters were struck from a 90% silver composition through 1964. 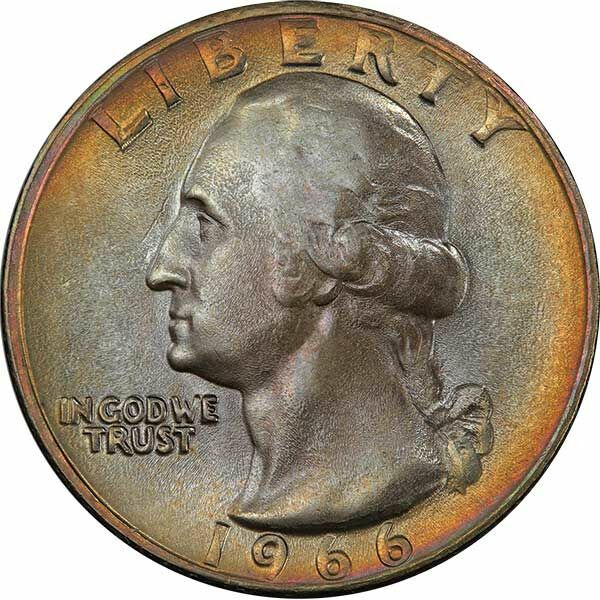 Beginning in 1965, circulating Washington quarters were struck in a copper-nickel clad composition, and from 1965 through 1968 no mintmarked pieces were made. In 1975 and 1976, quarters bore a special 1776-1976 dual date feature on the obverse and had a Colonial drummer boy design on the reverse to honor the nation?s bicentennial. The regular date style and heraldic eagle reverse resumed in 1977 and remained on the coin through 1998, after which the coin?s original heraldic eagle reverse was removed to provide canvas space for the various 50 State Quarters designs, which debuted in 1999. At that time, the obverse was significantly modified and the bust of Washington updated by William Cousins. Billions of Washington quarters exist and the coin is ubiquitous, but several issues are quite scarce. These include the 1932-D and 1932-S quarters, which serve as the series keys and are challenging to find and decent condition but are obtainable for a price. A few of the other earlier mintmarked issues are also tough, but much more common and more affordable in the circulated grades than the 1932-D and 1932-S. Otherwise, the rarest Washington quarters are generally varieties, which include the 1937 doubled die, 1942-D doubled die, 1943 doubled die, 1943-S doubled die, 1950-D D Over S, and 1950-S S Over D. Uncirculated specimens are generally plentiful, though some are much harder to come by than others. Perhaps surprising to some collectors is the fact that the 1982 and 1983 Washington quarters are legitimately scarce in uncirculated grades. This is because no official uncirculated sets were produced by the United States Mint that year and an historic recession caused many collectors to spend their uncirculated rolls of quarters. Thus, relatively few quarters from 1982 or 1983 were saved in uncirculated grades.